Students say getting a job is a top priority after graduation but less than 8% made an appointment at Career Services last year. Roughly 52% of students, according to a Spectrum survey, don’t even know UB has a career office. Sweet Home Senior High School officials removed the abandoned ropes course on UB land last month, according to UB Spokesperson Kate McKenna. 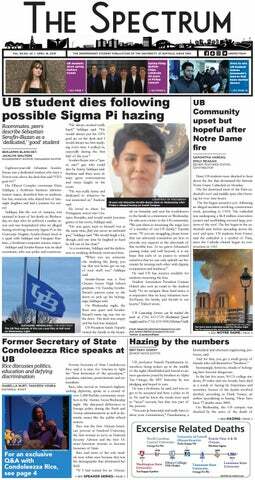 The Spectrum confirmed the removal Saturday, after high school and UB officials said they planned to take the course down this past November. Ronan Farrow, Pulitzer Prize-winning journalist, said the spirit of American diplomacy is “far from great shape.” He said people need to rise to create stability and opportunity. Farrow spoke about the power of journalism and diplomacy to a packed audience in the Center for the Arts on Thursday night. Farrow is an investigative journalist whose work on Harvey Weinstein’s sexual assault scandal earned him international acclaim. Farrow spoke for roughly an hour and a half on topics such as his bestselling book "War on Peace" and his journalistic work on sexual violence. Farrow wrapped up the night with an on-stage Q&A session and book signing. Black Student Union members discussed systemic racism, representation in faculty and UB’s treatment of the African and African American Studies program at its general body meeting Wednesday. BSU members and students talked throughout the meeting about the current state and future of the AAS program. Roughly 40 club members and students attended to voice concerns over the number of black faculty and AAS classes offered in the UB curriculum. The Spectrum found four hazardous waste containers on South Campus, three months after a state audit report criticized the university for its hazardous waste storage. The containers were in the Biomedical Education Building in areas accessible to students and the public late Friday afternoon. The University Bookstore partly reopened on Wednesday after Sunday’s windstorm blew the roof off the building and the university is still cleaning up roof debris. UB’s Music Library is now down to only one part-time librarian, which leaves the future of the library unknown. Former music librarian John Bewley is no longer an active librarian, according to Elizabeth Adelman, interim vice provost for University Libraries. Bewley, who retired this January, was the only music archivist at the library, according to UB Libraries’ website. The Spectrum reported in December that music faculty and students were concerned for the future of the library, following cuts to the staff. Bewley was the last librarian working with a music degree at the library. UB is looking to transform the job search experience with a new program: Here to Career. The program, which works directly with Student Life and Career Services, will give students on-campus jobs and pair them with advisers from multiple UB departments. This semester marks the launch of the program. Spring is here, but that doesn’t mean you’re not still panicking to figure out your schedule. Most students may have a heavy workload already and are looking for classes that are more enjoyable rather than tedious. We’ve compiled some classes that are not only worthwhile to take, but won’t feel so burdensome once midterm and final exams season hits. This list should come in handy after UB extended the spring semester add/drop deadline to 11:59 p.m. on Thursday.